There have been, up to this point, three eras of Godzilla films -- the Showa, the Heisei, and the Millennium periods. The Showa Era is the classic template that laid the groundwork for the two dozen films+ that followed. The Millennium series, born from the fallout of the theatrical disaster that was the US Godzilla film from 1998, rode the waves of creativity and stagnation leading to its own monumental meltdown in 2004. In the middle is the Heisei series. It, too, followed a similar trajectory of the later Millennium period. With each succeeding, and highly anticipated entry, that anticipation eventually grew into disappointment and indifference over the years towards this glossy time frame of the glorious Godzilla franchise. 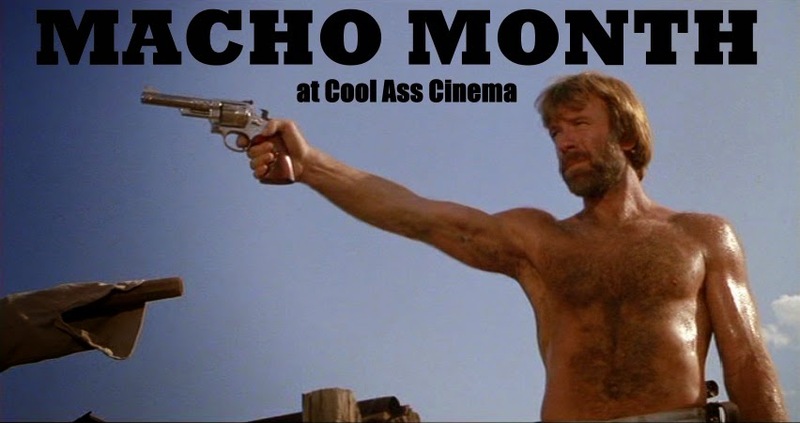 Still, seeing the 90s films via fan-subbed videotapes back then was an exciting time to be a fan of the genre. Taking a few movies to both find and lose its voice, the Heisei period enjoyed a great deal of box office popularity in its homeland. Ironically enough, the eras most creative work were in its experimental beginnings; and these were the least receptive with audiences. Moviegoers apparently wanted formula and familiar faces; and they got that in spades with each sequel. Unique to this era was that each film carried over into the next movie, and all were connected to the '54 film only. 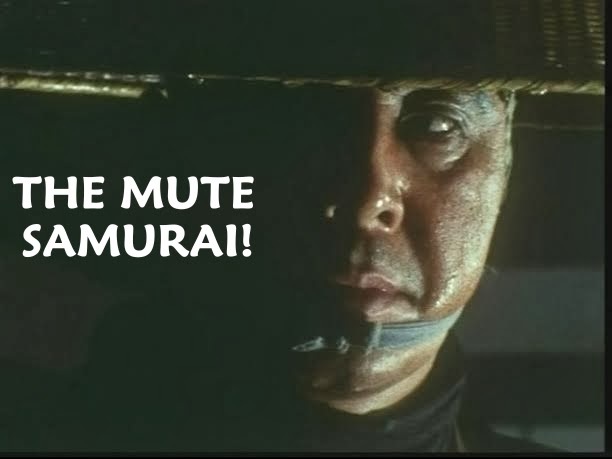 The Showa period films didn't exist. Ultimately, the Heisei films became the most lavishly empty, repetitively unoriginal, soulless series of the three eras. After TERROR OF MECHAGODZILLA (1975) failed to find favor at the box office in Japan, the series was put to rest for several years. However, the thought of Godzilla once more stomping cities underfoot simmered while the beast slept. The revivification of Godzilla was planned as early as February of 1978, but an actual script that was decided upon didn't occur till late 1983. With the hype of 'The Return of Godzilla' in full swing, Tomoyuki Tanaka was set to mount the most ambitious Godzilla movie ever. Mirroring the Dino disaster of '76 (the remake of KING KONG), an enormous 20 foot Godzilla cybot was constructed. Despite not being used much in the finished picture, this literal Big G came in handy for promotional purposes. 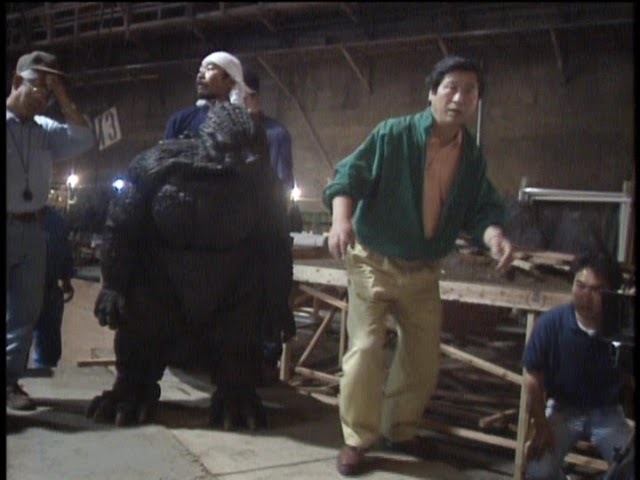 It also marked the debut of Kenpachiro Satsuma inside the Godzilla suit. A promising new beginning for the Big G was taking shape. 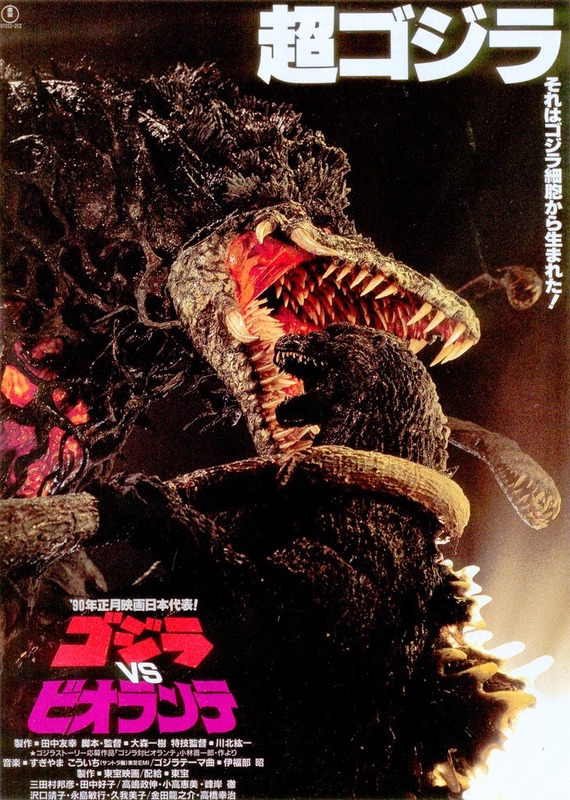 GODZILLA (1984), or as it was known in its radically altered US version, GODZILLA 1985 (1985), was something of a bridge between the Showa period and the Heisei. Many of the old guard worked on the picture, and it would be their last once the new crew took over by the time the actual official Heisei film, GODZILLA VS. BIOLLANTE (1989), became a reality. Koji Hashimoto, an AD on THE SUBMERSION OF JAPAN (1973), got the Godzilla gig; and the results are occasionally thrilling, and also tepid. Seeing it at that time (especially in theaters), it was quite different from any previous Godzilla movie regardless of which version you saw. Another major difference was the lack of participation by Akira Ifukube. For a film that ignores all previous G films, and directly links itself as a sequel to the '54 original, it's difficult to fathom Ifukube not being a part of this project. Reportedly he was ill at the time and could not participate. Reijiro Koroku's score sounds totally unlike anything heard in the series prior; and yet it makes one wish that at least a single strain of any number of Ifukube's classic compositions would make an appearance. The implementation of Koroku's best cues is the one area where the US release improves upon the Japanese original. Another AD from THE SUBMERSION OF JAPAN (1973) would become an integral part of the Heisei series starting in the 90s, but first, this wobbly, if auspicious beginning (the Millennium series started off rather shakily, too) was about to make some ground. I remember being stunned upon seeing some images from GODZILLA VS. BIOLLANTE (1989) in a 1989 comic magazine. 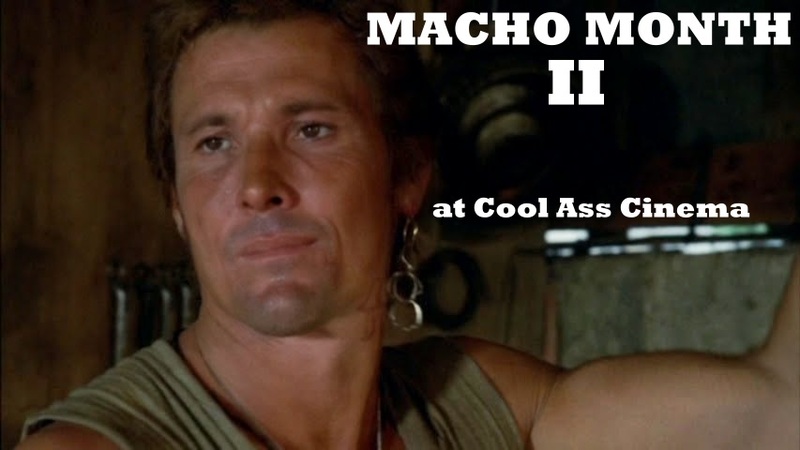 A theatrical release was planned, but one never came, unfortunately. I was even more riveted upon seeing it when it was dumped onto the home video market in 1992. A number of changes were immediately apparent. One of the most noticeable areas was in the SPX department. The script and music were others. BIOLLANTE, a direct sequel to the previous film, was a fresh, daring take on old material. Whereas the '84 film was passing the baton from the previous era, BIOLLANTE took the series in all new directions. 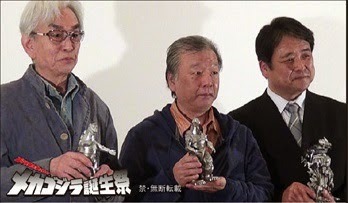 That director Kazuki Omori (above in middle with Kawakita at right) wasn't a huge fan of giant monster pictures is key to the films uniqueness. This ambivalence carried over into his other G directing job with 1991s fascinating and confusing GODZILLA VS. KING GHIDORAH. BIOLLANTE had an assortment of characters with varying agendas, and mixed Bondian elements with spirituality, espionage, psychic phenomena, and giant monsters in a heady stew for kaiju fans. 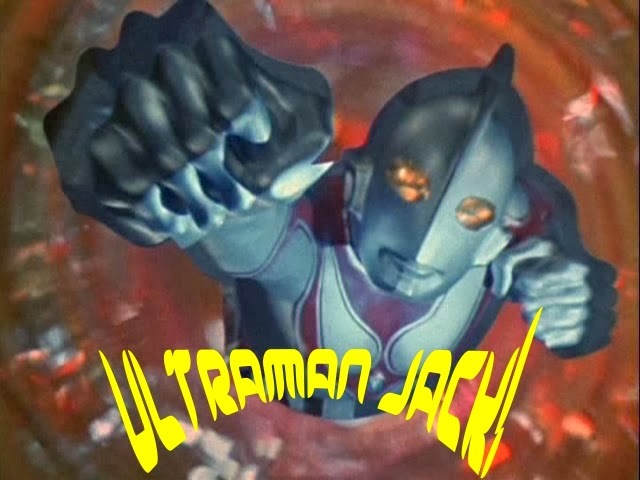 Award winning composer Koichi Sugiyama's score (he was responsible for the memorable theme for THE RETURN OF ULTRAMAN) was yet another deviation from the familiar sound of Ifukube (some of his iconic music is used, though), but was far more majestic than what Koroku had done in the '84 incarnation. It was also here where the Heisei series carved its one singularly original idea that stood out from the other two eras -- the inclusion of a recurring character in the form of psychic girl, Miki Saegusa. The other key to the eye-opening spectacle of the Heisei films, and its ensuing redundancy was SPX director, Koichi Kawakita. Koichi Kawakita joined Toho in 1962. 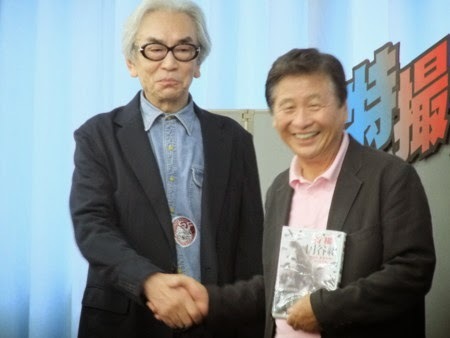 He participated in various capacities both behind and in front of the camera before moving into special effects directorship as an assistant on Tsuburaya's ULTRAMAN ACE (1972-1973) and again on ZONE FIGHTER (1973-1974); the latter show was where Kawakita had his first encounter with Godzilla. His first SPX directing credit was on Toho's ZERO PILOT (1976). He formed his own SPX production company, Dream Planet Japan Ltd., in 2003. Whereas Eiji Tsuburaya's work was passed on to Teruyoshi Nakano, so was the case with Kawakita. Revered by some, there's no denying the man was talented, and loved his craft. Unfortunately, his ingenuity only went but so far as gauged by his continuous work on the Heisei Godzilla series. 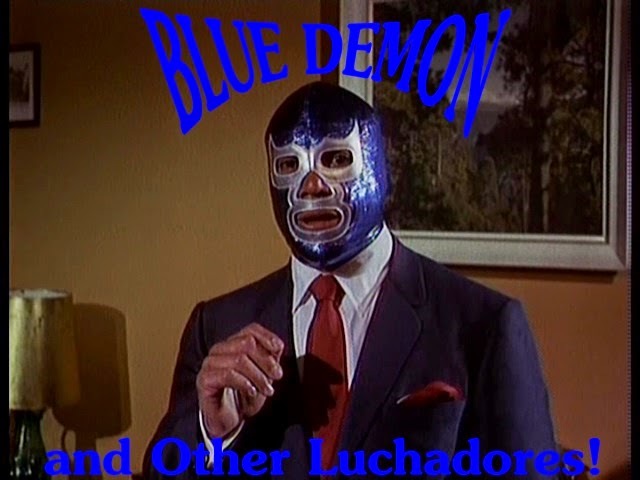 Kawakita either lost interest, or just simply ran out of ideas as the Heisei series progressed. He was known for a few signatures in his work -- some of these were distinctive, while others grew stale quickly. He was fond of having things transform, whether it be the monsters or the assorted mecha featured in the films; examples being Biollante's rose form, and final toothy, crocodile form; Mogera (or M.O.G.E.R.A.) transforms into two separate battle crafts for land and air. This wasn't something he started; it had been done countless times before in Japanese monster/SciFi films and TV shows of previous decades. About the only thing he added to it were monsters transferring their life force into a dying beast to bring them back stronger than before. 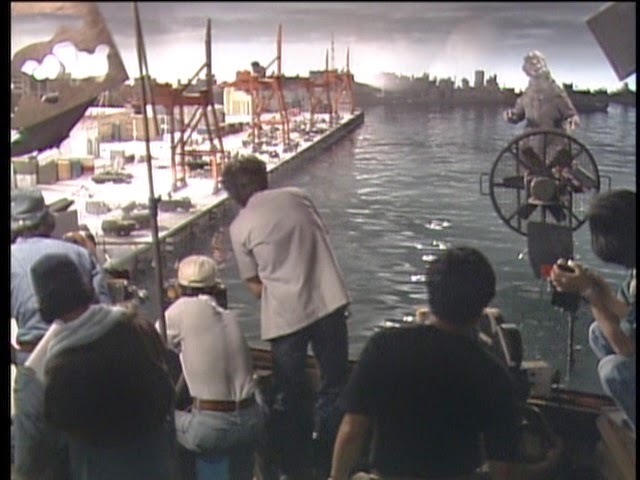 This meant lots of additional visual effects and laser beams -- an area the effects director would go hog wild beginning with GODZILLA VS. KING GHIDORAH in 1991. Kawakita never tired of his brightly colored laser light shows that substituted for actual monster battles. His idea of a 'great monster war' was to have two giant combatants standing at a distance while firing assorted lasers at each other (see above pics from GODZILLA VS. MOTHRA ). Virtually every monster would have laser attacks; and sometimes emitted from multiple orifices. Imagine Sanda and Gaira (from 1966s WAR OF THE GARGANTUAS) having a laser battle from a distance instead of the classic 'falls count anywhere' battle royal they indulge in; or try to imagine King Kong shooting beams out of his eyes and mouth in KING KONG VS. GODZILLA (1962). I'd bet Kawakita would have done it. If he can give a Pterodactyl a beam attack (Rodan in GODZILLA VS. MECHAGODZILLA from 1993), he can give one to a giant gorilla. 1. Monsters should fire lasers intermittently for minutes on end. 2. In between firing lasers, push, shove, or use lasers to knock monsters into buildings. 3. Transform monsters, or mecha, and fire new, corresponding lasers. 4. Change color of lasers to indicate a stronger, more powerful laser. 5. Shake camera to accentuate the power of the multitude of explosions caused by a multitude of laser beams. For all their flashy effects, acres of crumbling buildings, and enormous explosions, Kawakita's Heisei work sometimes looked strikingly low-tech compared with what Tsuburaya and his crew accomplished in the 1960s. 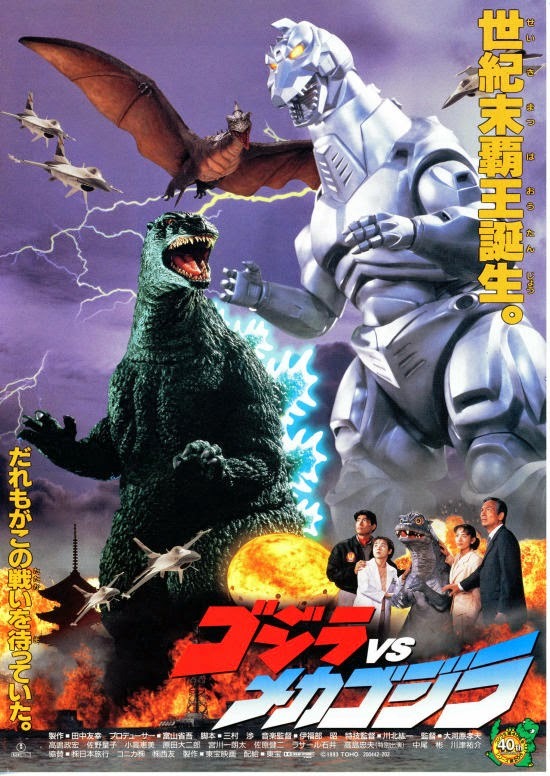 Take the 90s Godzilla and Mothra match up for instance; in the 60s version, the Mothra model was far more animated with moveable parts such as the head and legs. Mothra in the Kawakita era looked to have arthritis. 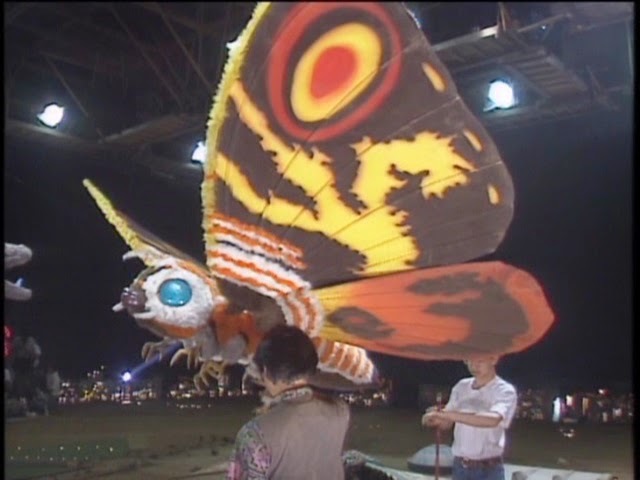 She looked like a plush toy by comparison with only the slightest mobility; and in spite of its fantasy origins, 60s Mothra felt far more realistic because she wasn't firing off laser beams from her antenna like in the 90s update. 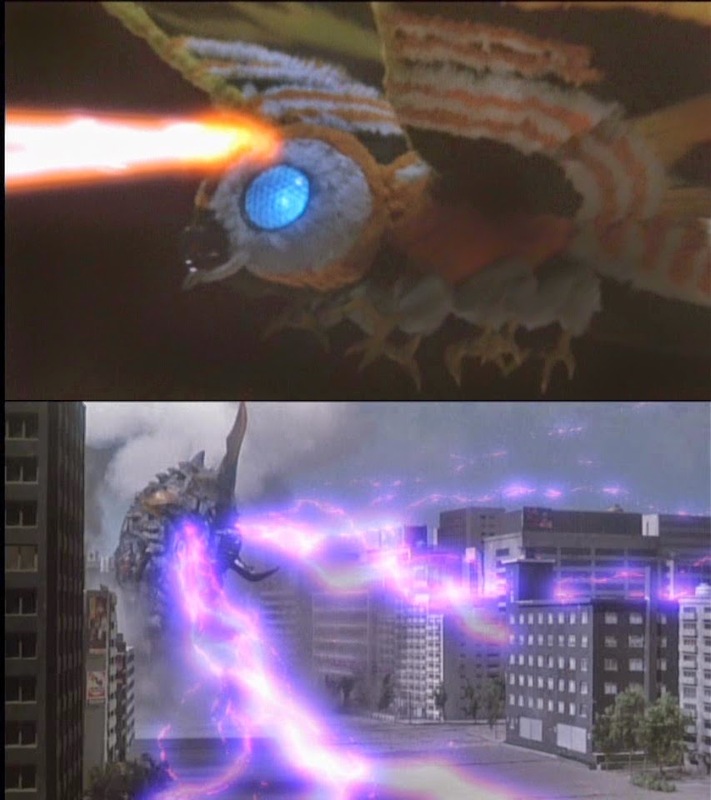 Beam attacks and pretty colors won out as the film became the biggest hit of the Heisei series, and led to a trilogy of cringe-inducing Mothra movies set in Kawakita's special effects world of Laser Land. Improvements had clearly been made in this second tier of Godzilla films, yet Kawakita's methods grew increasingly tiresome with little to no variance. Where his approach to SPX on BIOLLANTE was alive with creativity, the repeated use of the same types of shots and techniques grew stale by 1993. 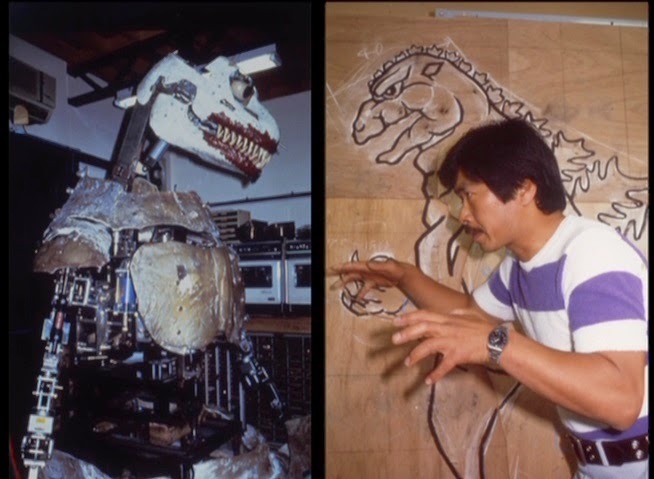 By 1995, the effects artist had resorted to using what appeared to be toys for effects scenes! His composite work, at one time impressive, had gotten sloppy, too. Another oft repeated technique was having the monsters, when firing their beam attacks, aim at the ground and gradually make their way to the target. I guess this was an excuse to squeeze more explosions into the scene. Ditto for airborne monsters flying over the ocean resulting in pockets of water erupting skyward. Speaking of flying kaiju, for some reason, Kawakita didn't feel it necessary to make the wings flap with any consistency at all. Often times his monsters would just glide, or the wings moved stiffly. 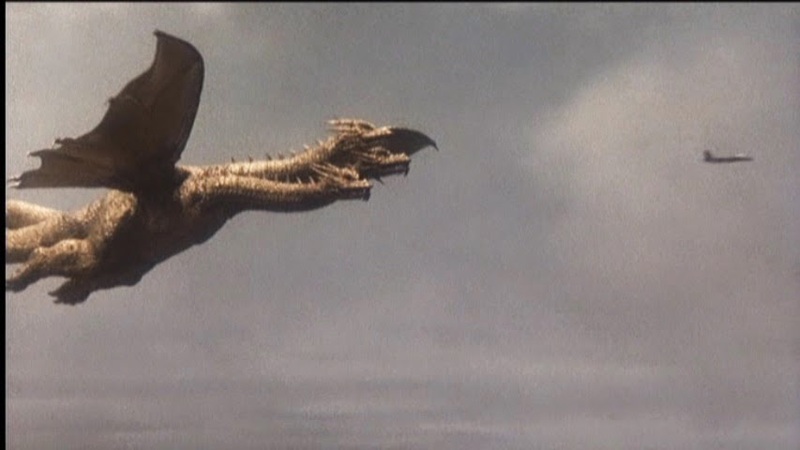 For example, King Ghidorah (in '91s GODZILLA VS. KING GHIDORAH) can't make up its mind if it wants to flap its wings or not; and when it does, they barely move. The Destroyer (in 1995s GODZILLA VS. DESTROYER) is the Pillsbury Dough Monster of the Godzilla series; and for such a wide bodied beast, he manages to stay in the air with nary a bit of movement from its wings. Possibly the best contribution to the series by Koichi Kawakita is in designing what is arguably the most fearsome look for Godzilla since the early Showa years. 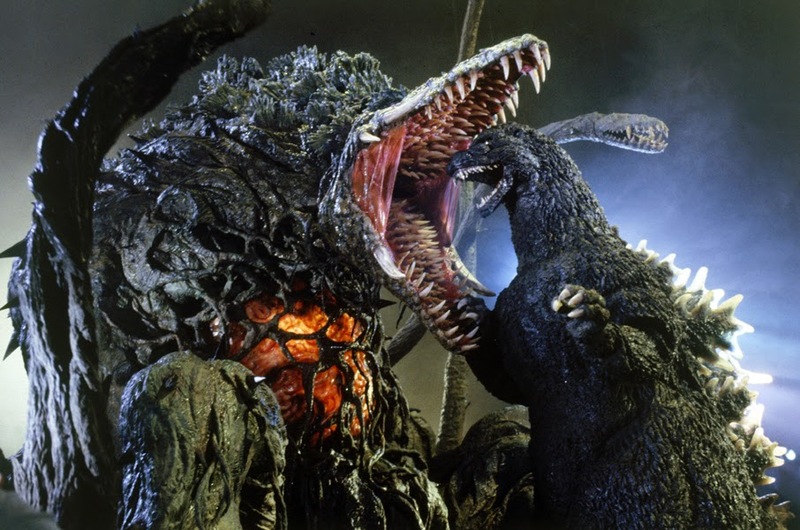 The King of the Monsters truly looked evil in BIOLLANTE and KING GHIDORAH. The latter film gave the beast a musculature that hadn't been done before. 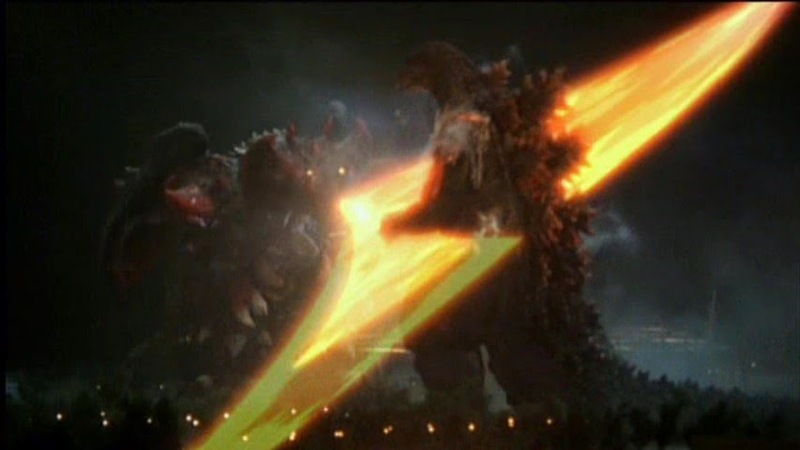 But while Godzilla is the King of the Monsters, Koichi Kawakita is the King of the Laser Beam Attack. Takao Okawara is another link in the Heisei chain, but the one who does the least amount of damage to it. 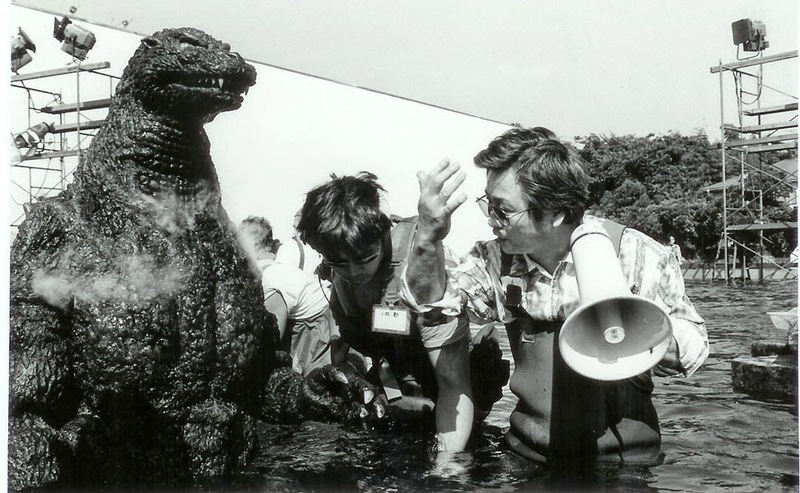 He began as an AD on THE SUBMERSION OF JAPAN (1973), and moved on to GODZILLA (1984) in the same capacity. Of the Heisei directors, he directed the most films with three entries. He also jump-started the Millennium series with GODZILLA 2000: MILLENNIUM (1999). 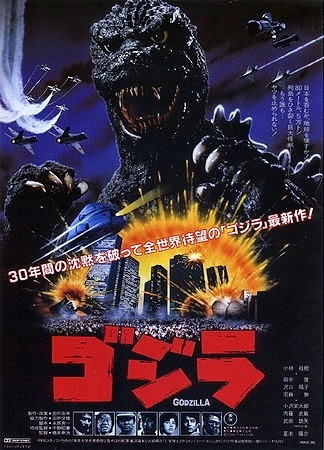 Additionally Okawara is notable for his '99 film being the first Godzilla movie garnering US theatrical release in 15 years. The Toho fantasy YAMATO TAKERU (1994) was directed by him as well. Okawara's style was arguably the most Honda-like. 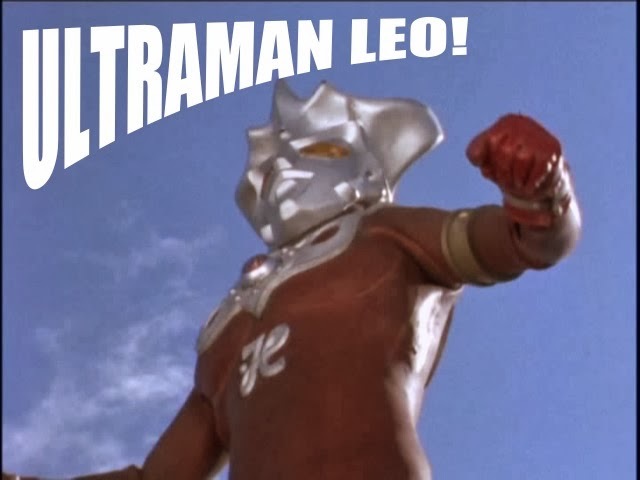 He ended the Heisei series much like Honda had begun it -- by killing off Godzilla. The Oxygen Destroyer did in the radioactive lizard in 1954, and he self-destructed, literally melting away in 1995. 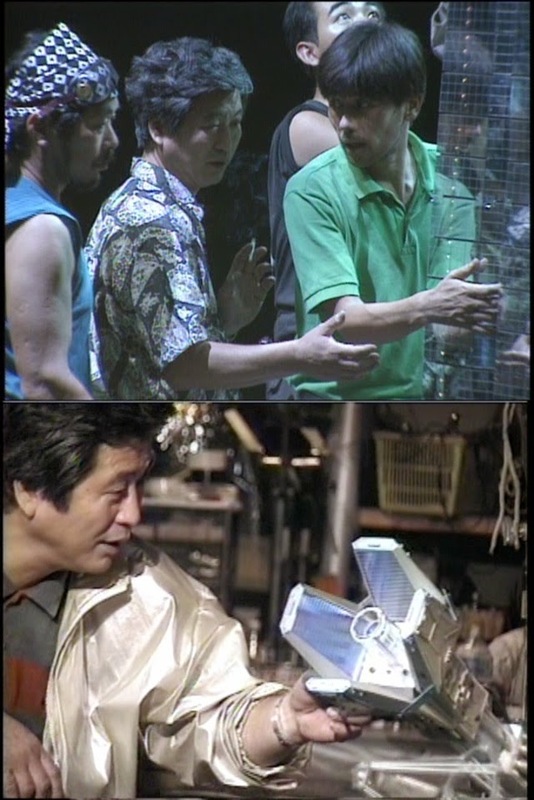 Even though Okawara's directing style brought about memories of master Honda, his films were often polluted with scenes lifted wholly from American films like RAIDERS OF THE LOST ARK (1981) and JURASSIC PARK (1993). Honda was an original through and through. Maasaki Tezuka, who inherited the Millennium mantle, mimicked Honda as well; and was at least able to wrangle some originality into his works unlike much of Okawara's output since nearly all his films are remakes of past, and better movies. For the most part, the Heisei series is little more than eye-candy bereft of characterization. At times, the monsters get so much screen time, you almost forget the Earth is populated by humans. Miki Saegusa (Megumi Odaka at right) is likable, but little is done with her character from one film to the next other than changing her hair style. A psychic with a link to Godzilla is an intriguing idea, but not much is done with this scenario. BIOLLANTE sets it up nicely, yet the concept flounders for the rest of the series. The scripts gave her little to do aside from standing on the sidelines looking worried about Godzilla and Baby G when he's introduced in the '93 version of MECHAGODZILLA. 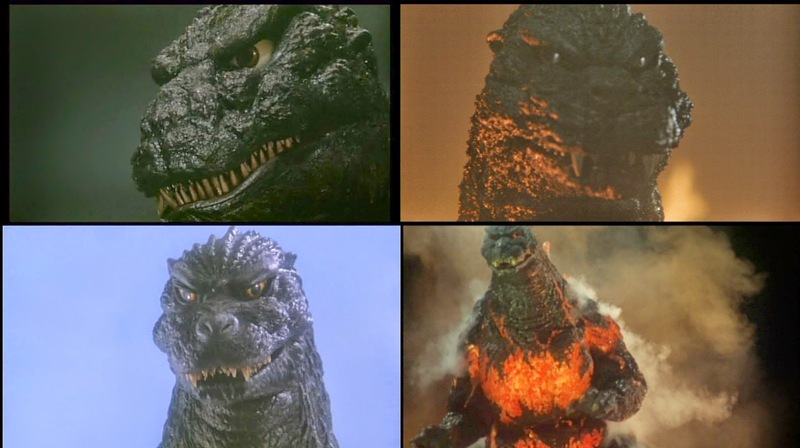 That middle film is the one that succeeds in deriving some emotional involvement with the bare minimum of characterization we're given for Saegusa; her conflict with being the deciding factor on killing Godzilla once and for all after a second brain is found near his spine. After this outing, an attempt was made to give her a love interest, but this too is squandered on special effects from an artist who seemed out of fresh ideas, and prone to rehashing old ones. In 1995, Daiei reemerged with an all new Gamera series that showed a monster movie could balance action with exposition, and still be an enthralling experience. GAMERA, GUARDIAN OF THE UNIVERSE (1995) hit theaters in March of that year while GODZILLA VS. DESTROYER (Destoroyah) landed December 9th. The differences between the two films were unmistakable. 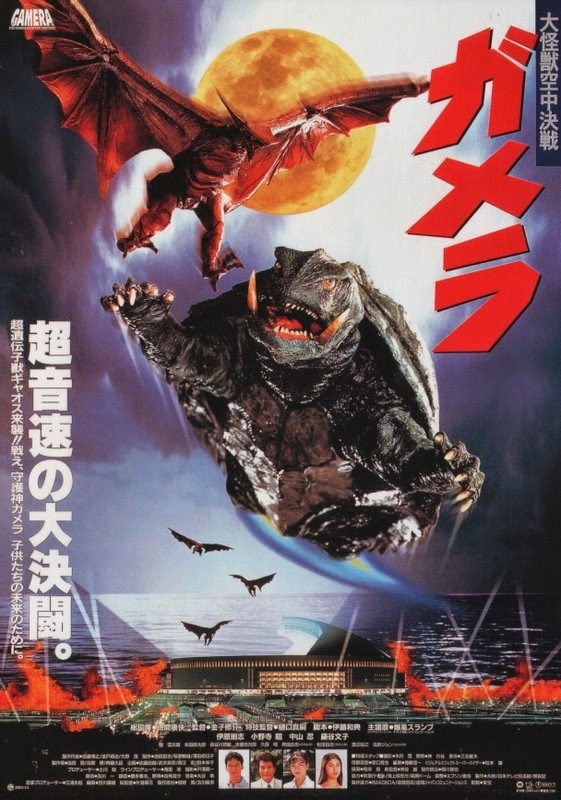 Toho's film beat Gamera at the box office, but Daiei's innovative take on their old franchise was the one that got international critical recognition, limited theatrical release in America, and regular airplay on US cable television. Putting the two side by side, it was clear just how stale Godzilla had become at that time. The Godzilla movie had an excellent plotline to wrap things up, but lazy effects work, uninspired action sequences, and unengaged characters paled in comparison to what Daiei offered in their Gamera opus. Things only improved with the first sequel the following year, GAMERA 2: ADVENT OF LEGION. Incidentally, Daiei's new Gamera series featured a girl (Steven Seagal's daughter, Ayako Fujitani) with a bond of sorts to the giant jet-propelled turtle that lasted for three movies, and an unrelated fourth entry that surfaced in 2006. Watching Toho's Heisei series now, it feels like a string of movies that mostly offer extravaganzas of laser battles with updated themes and ideas that were done better by past artists. Dotted with occasional moments of brilliance and poignancy, and nice odes to the classic era, the series quickly entered into a relationship with mediocrity that ended with the death of its main star. 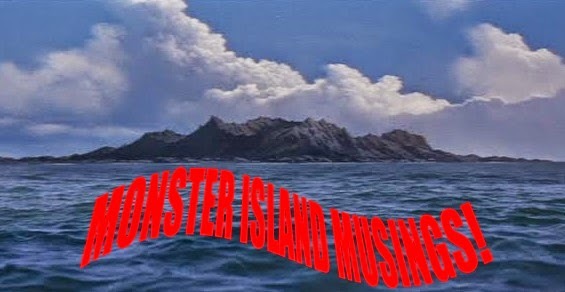 For the most part, the garishly bland monster battles coupled with threadbare exposition do not allow the pictures to hold up well to repeat viewings. They're entertaining in their way, but in the end, the laser lovin' Heisei entries will make one long for the seriousness of the 50s, the silliness of the 60s, and the second-rate, creative squalor of the 70s movies.